Free-running across rooftops while being chased relentlessly by a shadowy unknown enemy is not an experience I expected to find in a Facebook game. I also never expected to shout motherf****** at the top of my lungs at a Facebook game, so there's that. 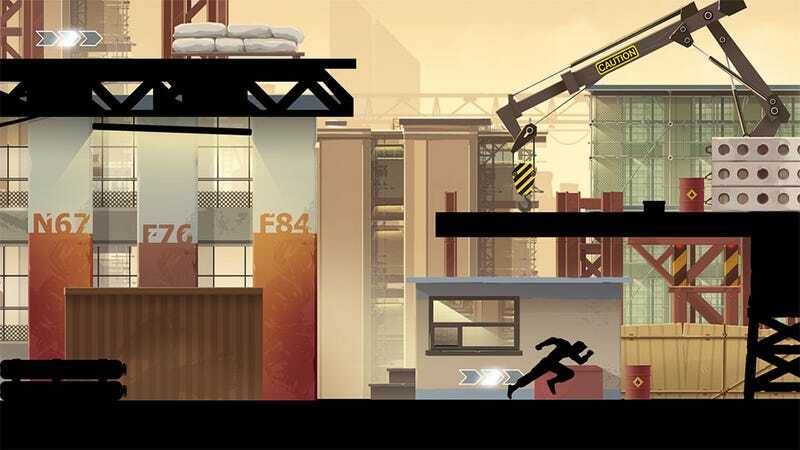 Created by Nekki, the developer behind Shadow Fight, Vector is a game that casts players in the role of a free-running escape artist being chased across rooftops by some unknown assailant. The game's Story Mode currently has absolutely zero story in it, so that's all we've got. Instead of story we get fast, fluid action as our protagonist leaps and slides through 26 levels across two different environments. The goal is to reach the escape point of each level, collecting all the bonus items and utilizing specific moves in specific situations. Those specific moves is where the Facebook free-to-play aspect of the game kicks in. You've got to purchase the necessary moves to three-star the levels. This can be done using currency earned by completing levels, which requires a ton of level grinding, or by spending some Facebook money. It's okay, it's not real money anymore. Frustration seems to be the key motivator in getting players to pay. The first two levels were a cakewalk. The third I retried at least a dozen times, my mouth getting more foul every passing minute. I shouted words at the screen I didn't know I knew, mixing common curses with everyday household objects. What's a sh**blender? I don't know, but when that damn enemy electrocuted me inches away from the safe zone, that's what he was. Vector still has a lot of content coming. Nekki is adding more levels, modes, multiplayer support, and probably more orange costume items to waste your money on once you've gotten all the moves down pat. What I've played here is an excellent beginning. Even when it's a co**doctor.